A draft Committee Substitute has been provided for the LUPZ Committee’s consideration that seeks to address Code Enforcement Division and neighborhood concerns about the enforceability of the requirement that the owner of the property live in either the primary or secondary dwelling unit. Shall record the terms of the approved Conditional Use Permit with the County Clerk, prior to occupancy of the SDU, so that it is noted on property records and will be known by a potential purchaser of the property. 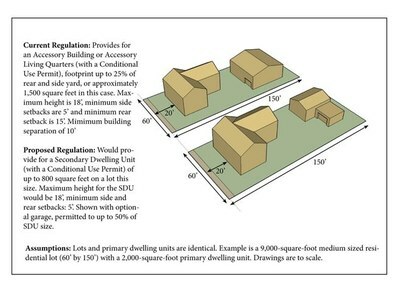 The updated regulations would also clarify the definition of occupancy to mean the property owner or beneficiary of an ownership trust, allow for a SDU to be located on top of a garage that is accessed by an alley in some cases, limit garages attached to SDUs to 50% of the size of that SDU, and make other clarifications and cleanups to the language that was originally proposed, including addressing recommendations from Planning staff made during the Environmental Planning Commission process. See the full staff writeup here.